The sister and I went to the mall to get ourselves some BB Cream. Run out of my stash and I was planning to change brand coz the one I’ve been using for more than a year is not moisturizing enough for my skin anymore. I think being pregnant makes my skin more dry. Anyway, after our BB Cream search - the sissy, her friend and I decided to catch Momzillas! I was telling them to watch About Time but they wanted the Pinoy movie so I gave in. Glad I did! It was oh so funny!! Corny, yes! But really funny!!! 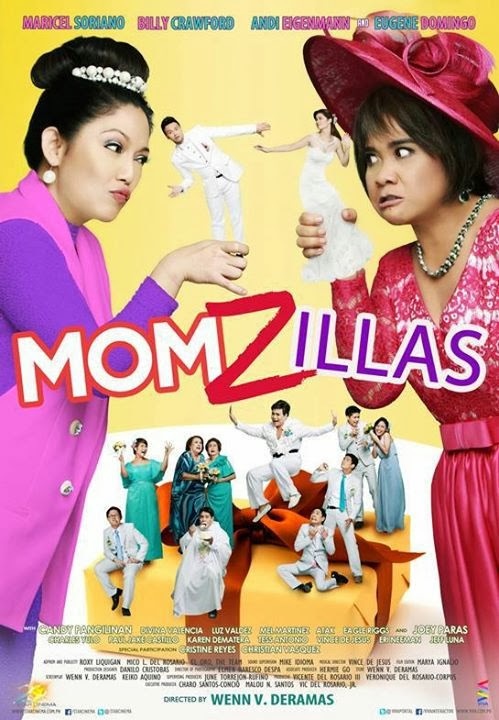 Maricel Soriano’s funny antics is to die for. And well, Eugene Domingo is no-brainer. Both of them are hilarious in this film. I’d find myself wondering why I was laughing my pants off when in fact it was oh-so corny. Pero waley! Corny ata talaga ako. I didn’t actually like the supporting cast except for Mel Martinez and that gay-brother of Eugene but well, Maricel and Eugene are enough. More than enough actually. It’s such a light film. Walang effort. Just enough to make you laugh. So if you want something as easy breezy, go catch this film. But we warned, corny talaga sya promise! !